No country provided more medical aid to Haiti than Cuba. Not only did they send a large contingent of medical personnel to the island nation in the wake of the devastating 12 January cataclysm, but Cuban doctors were there long before and they’re still there not. Yet the mainstream media largely ignored the single greatest contribution to the medical effort to fight the tragedy, leading Project Censored to declare the Cuban medical assistance on of the year’s top 25 censored news stories. 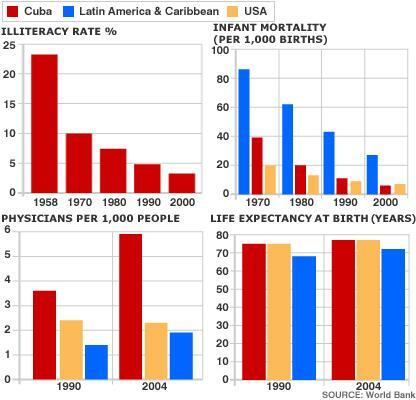 esnl readers have been reading about the Cuban aide since April, but folks who follow the major networks and major U.S. newspapers have little idea that Cuba ranks on a per capita basis as the world leader in medical aid to peoples in need. Cuba was the first to come into Haiti with medical aid when the January 12, 2010, earthquake struck. Among the many donor nations, Cuba and its medical teams have played a major role in treating Haiti’s earthquake victims. Public health experts say the Cubans were the first to set up medical facilities among the debris and to revamp hospitals immediately after the earthquake struck. Their pivotal work in the health sector has, however, received scant media coverage. “It is striking that there has been virtually no mention in the media of the fact that Cuba had several hundred health personnel on the ground before any other country,” said David Sanders, professor of public health from Western Cape University in South Africa. Haiti and Cuba signed a medical cooperation agreement in 1998. Before the earthquake struck, 344 Cuban health professionals were already present in Haiti, providing primary care and obstetrical services as well as operating to restore the sight of Haitians blinded by eye diseases. More doctors were flown in shortly after the earthquake as part of the rapid response. “In the case of Cuban doctors, they are rapid responders to disasters, because disaster management is an integral part of their training,” explains Maria Hamlin Zúniga, a public health specialist from Nicaragua. Cuban doctors have been organizing medical facilities in three revamped hospitals, five field hospitals, and five diagnostic centers, with a total of twenty-two different care posts aided by financial support from Venezuela. They are also operating nine rehabilitation centers staffed by nearly seventy Cuban physical therapists and rehabilitation specialists, in addition to Haitian medical personnel. The Cuban team has been assisted by one hundred specialists from Venezuela, Chile, Spain, Mexico, Colombia, and Canada, as well as seventeen nuns. However, in reporting on the international aid effort, Western media have generally not ranked Cuba high on the list of donor nations. One major international news agency’s list of donor nations credited Cuba with sending over thirty doctors to Haiti, whereas the real figure stands at more than 350, including 280 young Haitian doctors who graduated from Cuba. A combined total of 930 Cuban health professionals make Cuba’s the largest medical contingent on the ground in Haiti. Another batch of 200 Cuban-trained doctors from twenty-four countries in Africa and Latin American, and a dozen American doctors who graduated from medical schools in Havana, went to Haiti to provide reinforcement to existing Cuban medical teams. By comparison, the internationally renowned Médecins Sans Frontières (MSF or Doctors without Borders) has approximately 269 health professionals working in Haiti. MSF is much better funded and has far more extensive medical supplies than the Cuban team. in front of television cameras discussing health priorities and medical needs, the Cuban medical teams are missing in the media coverage. Richard Gott, the Guardian’s former foreign editor and a Latin America specialist, explains, “Western media are programmed to be indifferent to aid that comes from unexpected places. In the Haitian case, the media have ignored not just the Cuban contribution, but also the efforts made by other Latin American countries.” Brazil is providing $70 million in funding for ten urgent care units, fifty mobile units for emergency care, a laboratory, and a hospital, among other health services. Venezuela has canceled all of Haiti’s debt and has promised to supply oil, free of charge, until the country has recovered from the disaster. Western NGOs employ media officers to ensure that the world knows what they are doing. According to Gott, the Western media has grown accustomed to dealing with such NGOs, enabling a relationship of mutual assistance to develop. Cuban medical teams, however, are outside this predominantly Western humanitarian-media loop and are therefore only likely to receive attention from Latin American media and Spanish language broadcasters and print media. Figures released last week show that Cuban medical personnel, working in 40 centres across Haiti, have treated more than 30,000 cholera patients since October. They are the largest foreign contingent, treating around 40 per cent of all cholera patients. Another batch of medics from the Cuban Henry Reeve Brigade, a disaster and emergency specialist team, arrived recently as it became clear that Haiti was struggling to cope with the epidemic that has already killed hundreds. Since 1998, Cuba has trained 550 Haitian doctors for free at the Escuela Latinoamericana de Medicina en Cuba (Elam), one of the country’s most radical medical ventures. Another 400 are currently being trained at the school, which offers free education – including free books and a little spending money – to anyone sufficiently qualified who cannot afford to study medicine in their own country. This tradition can be traced back to 1960, when Cuba sent a handful of doctors to Chile, hit by a powerful earthquake, followed by a team of 50 to Algeria in 1963. This was four years after the revolution, which saw nearly half the country’s 7,000 doctors voting with their feet and leaving for the US. The travelling doctors have served as an extremely useful arm of the government’s foreign and economic policy, winning them friends and favours across the globe. The best-known programme is Operation Miracle, which began with ophthalmologists treating cataract sufferers in impoverished Venezuelan villages in exchange for oil. This initiative has restored the eyesight of 1.8 million people in 35 countries, including that of Mario Teran, the Bolivian sergeant who killed Che Guevara in 1967. The Henry Reeve Brigade, rebuffed by the Americans after Hurricane Katrina, was the first team to arrive in Pakistan after the 2005 earthquake, and the last to leave six months later. A third of Cuba’s 75,000 doctors, along with 10,000 other health workers, are currently working in 77 poor countries, including El Salvador, Mali and East Timor. This still leaves one doctor for every 220 people at home, one of the highest ratios in the world, compared with one for every 370 in England. Wherever they are invited, Cubans implement their prevention-focused holistic model, visiting families at home, proactively monitoring maternal and child health. This has produced “stunning results” in parts of El Salvador, Honduras and Guatemala, lowering infant and maternal mortality rates, reducing infectious diseases and leaving behind better trained local health workers, according to Professor Kirk’s research. Medical training in Cuba lasts six years – a year longer than in the UK – after which every graduate works as a family doctor for three years minimum. Working alongside a nurse, the family doctor looks after 150 to 200 families in the community in which they live. This model has helped Cuba to achieve some of the world’s most enviable health improvements, despite spending only $400 (£260) per person last year compared with $3,000 (£1,950) in the UK and $7,500 (£4,900) in the US, according to Organisation for Economic Co-operation and Development figures. Infant mortality rates, one of the most reliable measures of a nation’s healthcare, are 4.8 per 1,000 live births – comparable with Britain and lower than the US. Only 5 per cent of babies are born with a low birth weight, a crucial factor in long-term health, and maternal mortality is the lowest in Latin America, World Health Organisation figures show. Cuba’s polyclinics, open 24 hours a day for emergencies and specialist care, are a step up from the family doctors. Each provides for 15,000 to 35,000 patients via a group of full-time consultants as well as visiting doctors, ensuring that most medical care is provided in the community. This entry was posted in Cuba, Deep Politics, Health, History, Latin America. Bookmark the permalink.